Reduce your dependence on high priced, non-renewable home heating fuels by burning wood. Turn your furnace down in the rooms you aren't in and enjoy comforting warmth in your main living area with a wood product. All wood units listed have been tested and certified to the strictest clean air standards as set by the United States Environmental Protection Agency (EPA). 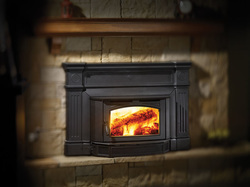 Most brands listed carry a broad selection of wood stoves, inserts and fireplaces. Each reflecting many design options from traditional, contemporary and cast iron. For more information, please click on the manufacture's website. We have many of their units on display in our showroom. Wood inserts fit into an already existing masonry brick fireplace and often into an existing zero clearance wood fireplace. Did you know that burning in your open masonry fireplace can allow as much as 90% of your fire's heat to escape out the chimney? By adding a wood insert, you will keep the heat in your home. Regency, Hampton, Pacific Energy, Alderlea and Osburn have wood inserts. Pacific Energy's True North wood INSERT--AFFORDABLE QUALITY! Wood stoves usually fit into almost any room where the unit can be vented to the outside or through a chimney. The wood stoves we carry deliver superb heating performance, easy loading and operation and reliability. With many options available, its easy to compliment any home. 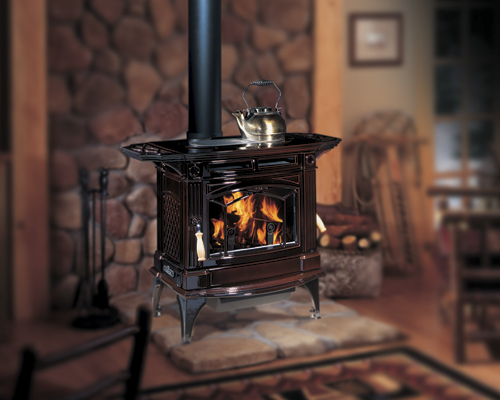 Pacific Energy's True North Wood Stove--AFFORDABLE QUALITY! EVERY SITUTION IS DIFFERENT....PLEASE SHARE YOUR IDEAS AND WE WILL MAKE SURE ITS CORRECT AND SAFE! Zero-clearance Wood fireplaces are an excellent option for new construction. They need to be placed into a room that can be vented straight up through the ceiling. They may be answer if you want the fireplace look. CLICK ON BRANDS BELOW FOR MORE INFORMATION!!! !